In our continued endeavor to provide safe and comfortable mass transportation to new and upcoming smart cities, Tata Motors today delivered 30 new buses to the BMTC (Bengaluru Metropolitan Transport Corporation). The new delivery is a part of a larger order of 1385 buses bagged by Tata Motors comprising of the Ultra 6/9 BS IV Midi and LPO 1512/55 BS IV buses. Honorable Chief Minister of Karnataka, Shri. Siddaramaiah and Transport Minister, Shri. R Ramalinga Reddy along with officials from BMTC and Tata Motors were present at the handover ceremony. The Ultra 6/9 is a BS-IV ready fully built bus equipped with a fuel efficient TATA 497 TCIC engine which generates power of 92Kw@2400 rpm & maximum torque of 400 Nm@1300 to 1600 rpm. With a seating capacity of 30 seats, the new buses are 9 m in length and 2.5 m in width, giving ample gangway space for standees. These buses are also fitted with Fire detection and suppression system. The Tata LPO 1512 is equipped with a fuel efficient ISBe 5.9 BSIV engine, which generates power of 98Kw@2500 RPM and maximum torque of 430 Nm@1300 to 1800 rpm. Powered by Tata Cummins SCR technology, the Tata LPO 1512/55 ensures good mileage in city operations. 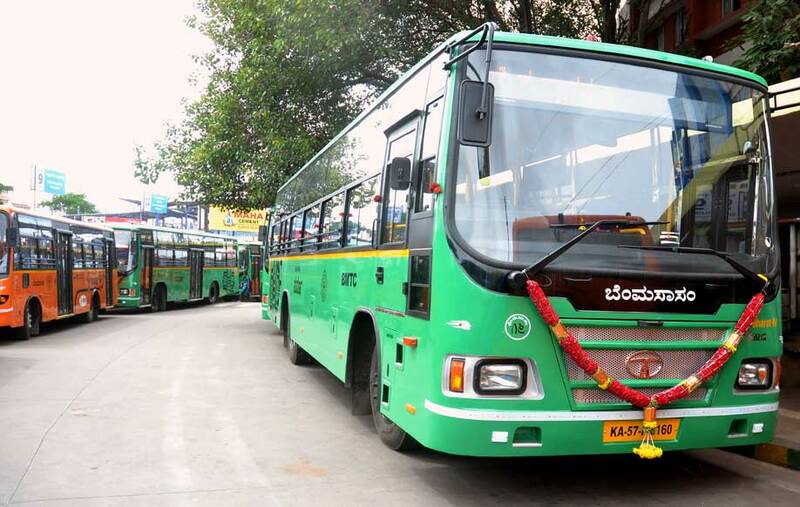 These will be one of the most fuel efficient 11 meter buses in the BMTC fleet. The vehicle is well assisted by Weveller Suspension at the front, which takes vertical load and offers stiffness, aiding the bus to travel in a straight line. Pneumatic suspension at the rear, make the ride comfortable for the commuter. customers’ needs with an entire gamut of day-to-day mass passenger transport solutions. The company continues to be a leader in this segment not just by setting technological benchmarks, but by also adapting innovations effectively to suit travel conditions in Indian cities and rural areas. The company continues to actively participate in the development and implementation of solutions for mass passenger transport in key markets across the world. Tata Motors Limited is India’s largest automobile company, with consolidated revenues of INR 269,850 crores (USD 41.6 million) in 2016-17. Through subsidiaries and associate companies, Tata Motors has operations in the UK, South Korea, Thailand, South Africa and Indonesia. Among them is Jaguar Land Rover, the business comprising the two iconic British brands. It also has an industrial joint venture with Fiat in India. With over 9 million Tata vehicles plying in India, Tata Motors is the country’s market leader in commercial vehicles and among the top in passenger vehicles. Tata cars, buses and trucks are being marketed in several countries in Europe, Africa, the Middle East, South Asia, South East Asia, South America, Australia, CIS and Russia.